Can I change my train ticket? Go to your Loco2 account and read the fare conditions associated with the ticket you want to change. If you didn't sign up for an account when you placed the order, don't worry! You can sign up now using the same email address and any associated bookings will appear automatically. Click on "Exchange options" and choose the tickets you'd like to change. Choose your new travel date and departure time, then press "Find new trains". Select your new trains and tickets. Make sure you select the same or higher travel class. Get a "quote" for the exchange, then proceed to payment if you are happy with the price. Your new tickets will become available in your account and your new booking confirmation email will be sent out a few minutes after your payment has completed. Staff at the ticket office can change your tickets, as long as your fare conditions allow it. They will need your collection reference. Italian tickets can only be changed at the station, not online. Domestic Spanish tickets cannot be changed at the station, only online via your account. 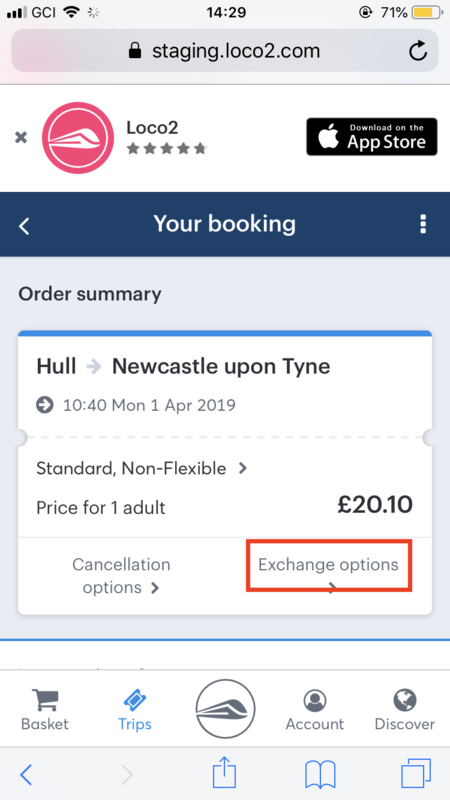 If you need to exchange your tickets at short notice, please try to exchange them via your Loco2 account first. Your exchange must be done before your train departs. If you don't know what tickets you want to book instead, it is better to refund them..